The best day of the year is almost here! 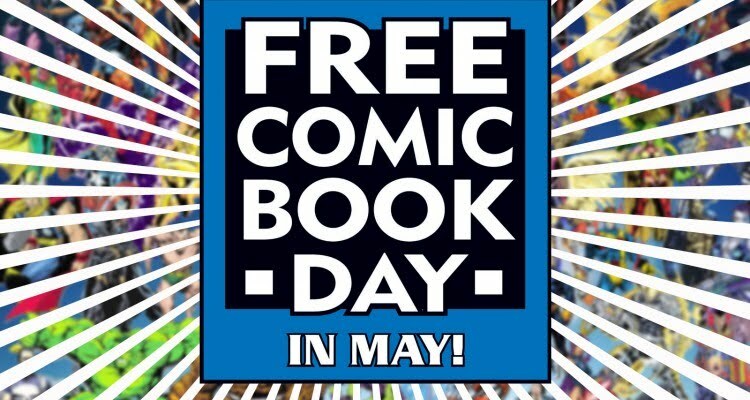 Midtown Comics is thrilled to celebrate yet another edition of Free Comic Book Day, both in-store on Saturday, May 7th, and online on Monday, 9th! All of the FCBD titles from every participating publisher will be offered for free, with no purchase required, in-store and online while supplies last. We’ll also have special Midtown-branded editions of two FCBD Marvel and DC Comics – read on for more info on those exclusives! Please note: Everyone is welcome to one copy of each FCBD title while supplies last. Some titles will be in very limited quantities and are not expected to last all day, and we recommend that you arrive/order online early. FCBD books are not bagged and boarded, condition (grade) is not guaranteed, replacements will not be available. All FCBD titles from our website will start to ship on Wednesday, May 11th. There may be delays due to the volume of orders. We appreciate your patience. Midtown Comics is excited to celebrate Free Comic Book Day with two days this year – in-store on Saturday, May 3rd, and online on Monday, May 5th. This is one of the largest events in the comic book industry, and Midtown is gearing up for eager fans! 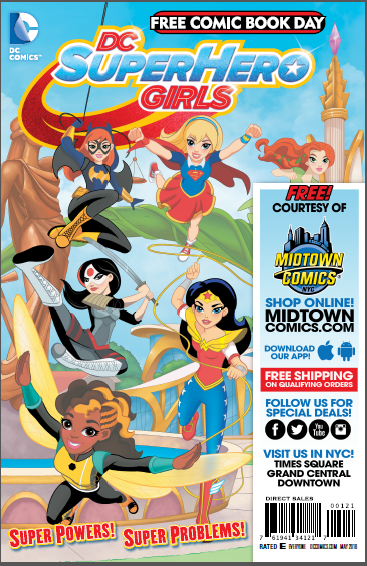 Midtown Comics celebrates Free Comic Book Day in-store on Saturday, May 3rd, by offering free new comics including every title from every publisher participating in this event. Some of the hottest titles from Marvel Comics, DC Comics, Dark Horse and Image Comics will be available with no purchase required, while supplies last. Over two million comic books for readers of all ages will be given away by participating stores nationwide, introducing as many people as possible to the excitement of comic books! Please note: some titles will be in very limited quantities and are not expected to last all day, and we recommend that you arrive early. 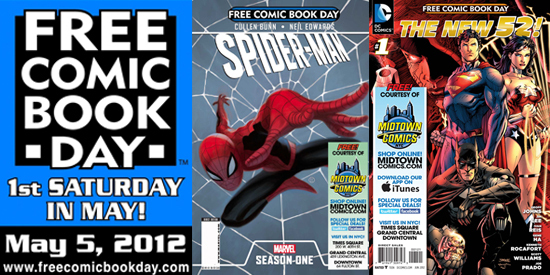 FCBD starts at 8:00AM at Midtown Times Square, and 11:00AM at Grand Central and Downtown. All FCBD titles will be posted online at approximately 11:00AM EST on Monday, May 05th and will be offered while supplies last. We recommend that you order early. Please be aware that while the books are free, there is a handling fee per book. 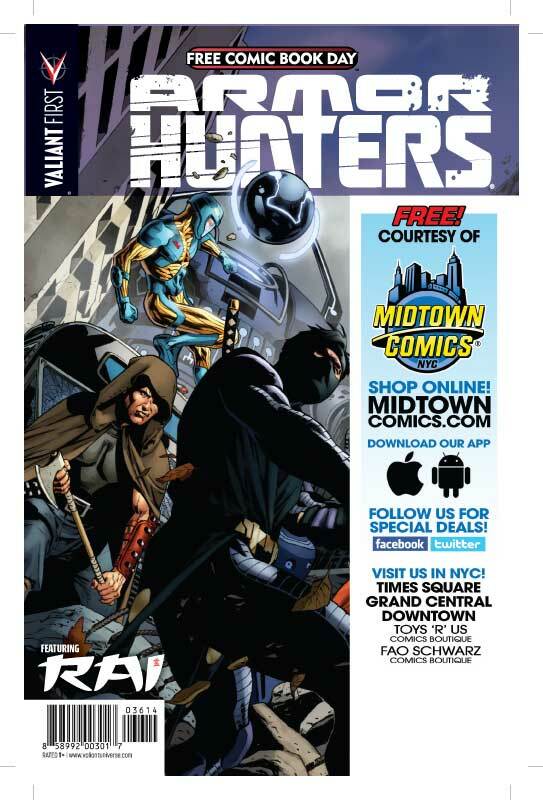 What’s special only at Midtown: This year we are thrilled to present our very own versions of the Free Comic Book Day book Future’s End from DC Comics and the Armor Hunters Special from Valiant Entertainment! 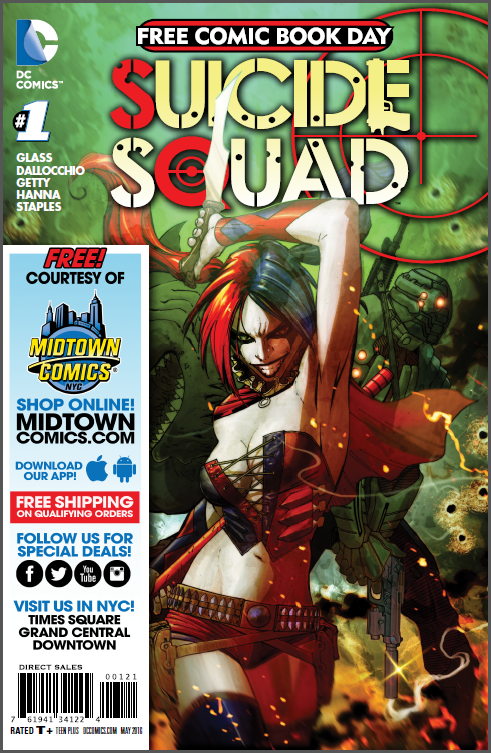 Both feature the Midtown Comics logo and are ONLY available through Midtown Comics! Future’s End is the place to jump on board DC Comics’ epic weekly series featuring tomorrow’s Dark Knight, Batman Beyond (making his first appearance in The New 52), battling an army of cyborgs to avert an Apocalypse in the future which could destroy the DC Universe of the present! Armor Hunters features a group of the universe’s fiercest warriors, that have come to destroy the X-O Manowar for the good of all. What horrible secrets does the armor hold? And how many armors have they destroyed before this one? These answers and more are revealed in the Valiant Universe event of 2014 – and it all starts right here with exclusive previews, character designs, and interviews from the biggest guns the Valiant Universe has to offer! Click through for more exciting details! 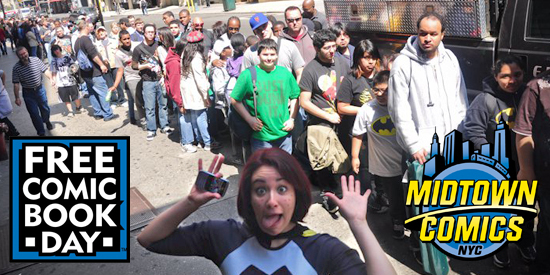 WATCH NOW: Free Comic Book Day 2012 at Midtown Comics Times Square! Free Comic Book Day 2012 at Midtown Comics! 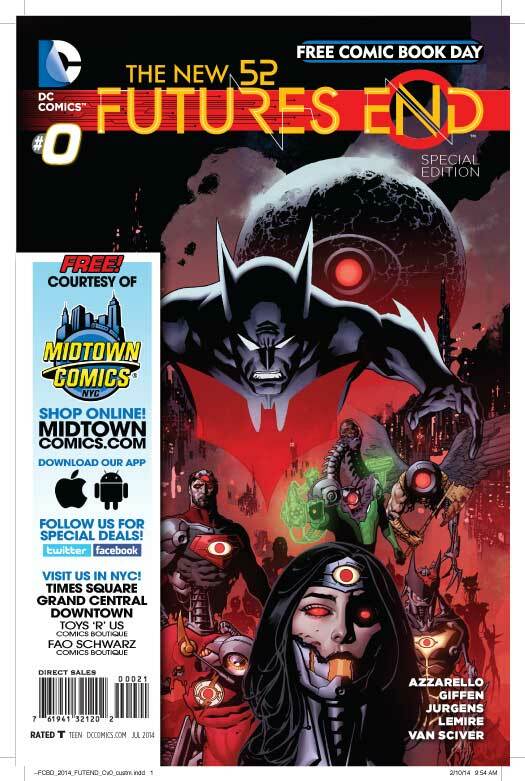 Midtown Comics celebrates Free Comic Book Day, on Saturday, May 5th, by offering free new comics including every title from every publisher participating in this event. Some of the hottest titles from Marvel Comics, DC Comics, Dark Horse and Image Comics will be available with no purchase required, in-store and online while supplies last. Over two million comic books for readers of all ages will be given away by participating stores, introducing as many people as possible to the excitement of comic books! Check out all the details for what we think is the best day of the year! Hello Midtown Bloggerinos! Raph here with a little double dose of blog talk. First, FCBD was this past weekend! I’m going to talk about the craziness of FCBD from the Midtown perspective, as well as highlight some books and talk about why FCBD is important for the industry… On with the FREE COMICS!